Tofino favourites, voted for by Tofino Time readers in early 2011. The results are in! The readers of Tofino Time Magazine have chosen their favourites in Tofino! ﻿The gastronomical extravaganza of the Oyster Festival was your favourite event last year with the Whale Festival as its popular second. ﻿While skipping work we seem to either jump in the water for a surf or spend some time outside walking on the beach. ﻿By far Chesterman Beach is our favourite place to watch the sunset. MacKenzie Beach is an other popular spot. ﻿For a little time away most folks headed to the lake or down island to Victoria. ﻿Out in the surf was your place of choice for this B.C. ritual or chilling out at home. ﻿The downtown core seems to be our location of choice for this pastime with Tuff Beans patio being the top choice and the Common Loaf second. ﻿The ocean is the center of our lives here so our favourite sports were surfing and fishing. Not a bad lifestyle Tofino. ﻿When it came to truly un­winding we either hid ourselves in our homes or hit the beach. ﻿The Sacred Stone Spa was the most popular choice for a spa experience or some time in the Ancient Cedar Spa as it the next favourite. ﻿Getting in the water can mean many things around here. You love to dip yourself in the Hot Springs up the coast or suited up for a surf at Cox Bay. ﻿Tofino’s choice for a good jolt of the liquid life was Caffé Vincente with the Common Loaf and Tuff Beans close seconds. ﻿Caffé Vincente was our readers’ choice as the best place to have breakfast, with the Common Loaf as your second. ﻿For our mid-day refuel your first choice was by far Sobo and as a second option you evenly craved the Wildside Grill and Tacofino. ﻿When we think about treating ourselves to a dinner out our first choice is Sobo with Shelter as a close second. ﻿Chocolate Tofino was your location of choice for a sweet treat, with Sobo as its closest rival. ﻿For a cocktail or cold one your favourite haunt is Shelter or to head on down to the Dockside Pub. ﻿Tofino’s favourite spot for choosing a bottle is Sobo and Long Beach Lodge was your next choice. ﻿For a yummy snack on the run it was a tie for first place between The Wildside Grill and Tacofino. The second choice was Sobo. ﻿When it came to recommending a place to stay while in our area Long Beach Lodge was the popular choice with Pacific Sands as your next to recommend. ﻿Ocean Outfitters was voted as your favourite with Remote Passages as a strong second place. ﻿It was a tie for the favourite surf shop between Storm and Surf Sister. Long Beach Surf Shop was the next choice. ﻿Eagle Aerie Gallery of Roy Henry Vickers was your first choice with Reflecting Spirit the next favourite. ﻿For some retail therapy your opinions were evenly split between Upstairs Boutique, The Studio House and Covet. ﻿The two new businesses that left the biggest mark on Tofino this year were Tacofino and Knits By The Sea. 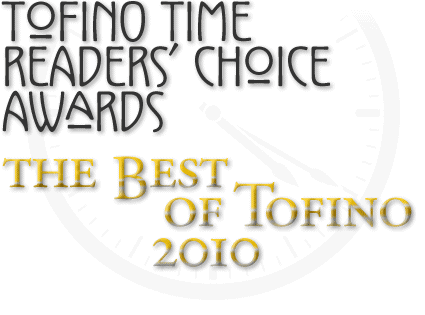 Tofino Time Readers’ Choice Awards results from March 2011: The Best of Tofino in 2010 as voted for by readers of Tofino Time Magazine.